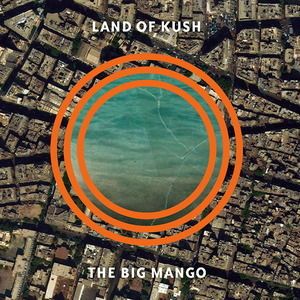 Constellation are proud to present the latest from Sam Shalabi’s Land of Kush ensemble, The Big Mango. Inspired by and dedicated to the city of Cairo (Shalabi’s home since 2011), the album rallies more than 20 Montreal musicians to create some of the most immediate, impassioned and profound work we’ve seen from Sam yet. The album hits UK/EU stores 30 September. See below for more album info, including an audio sample of album track “The Pit”, or click here for the full run-down. Osama (Sam) Shalabi moved to Cairo in 2011, settling in an apartment one block from Tahrir Square, in the midst of Egypt’s ‘Arab Spring’. Shalabi describes The Big Mango, his new and phenomenal work for his Land Of Kush big band, as “a love letter to Cairo” framed by “the beautiful, surreal madness of the city…as joyous, horrific, historical events were unfolding”. The music was also inspired by time spent in Dakar, where in Senegal’s music scene Sam experienced parallels to another of his central aesthetic and political touchstones, Brazilian Tropicalia, in the sense of a “positivity, complexity and radicalism in art that was also playful and joyous and wasn’t necessarily part of a ‘revolution’ but seemed to be a form of innate radicalism”. In tandem with the relative openness of Dakar’s Islamic society – with the much more prominent role and presence of women in public and private life and the relaxed physicality and sensuality of the culture in general – Senegalese music offered a powerful counterpoint and feeling of promise for Egypt’s own future. “The Big Mango” is one of the many nicknames for Cairo, but for Shalabi it also evokes the succour and sensuality of southern hemispheric music more generally, in this relation to broader socio-political movements. 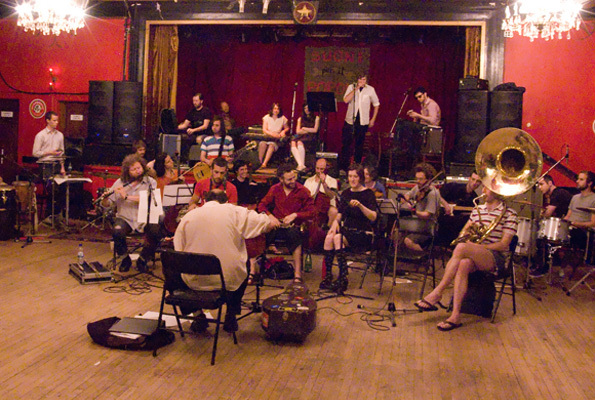 Montréal remains Shalabi’s home base and the city to which he briefly returned towards the end of 2012 to reconvene the troupe of players that have helped him realize his large-scale works under the Land Of Kush moniker. Working through The Big Mango score with these local musicians culminated in two ecstatic live performances and a recording session at Montréal’s Hotel2Tango studio. This third album by Land Of Kush is arguably the group’s most focused and immediately satisfying. For Shalabi, gender and Arab culture has been a central theme, one he took up explicitly on the previous Kush album Monogamy (2011), and which similarly drives The Big Mango, where once again a series of female vocalists drawn from Montréal’s indie rock community anchor the work and convey what in most of the North African Arab world remains a profoundly unrealized though burgeoning spirit of gender equality, participation, expression and liberation. This promise is at the heart of Shalabi’s “love letter”. The Big Mango opens with a bubbling Fauvist stew of balafon, flute, electronics and vocalizations which abruptly segue into solo piano and saxophone improvisations – an introductory set of musical mating calls that invoke the album’s deeper conceptual and formal preoccupations. The libidinal energy of rock n’ roll is then re-situated in a heterodox Middle Eastern context as the album’s centerpiece songs unfold: ”The Pit”, “Mobil Nil”, “Drift Beguine” and “The Big Mango” each marked by propulsive female vocal performances from Ariel Engle, Katie Moore, Elizabeth Anka Vajagic and Molly Sweeney respectively. Underpinning each of these singers is some of Land Of Kush’s s most melodically and rhythmically compelling music, conjuring a post-modern psychedelia that is truly sui generis. The band delivers the grooves and soloists unleash excursions more fluidly than ever; for many of these players, it’s the third time around embracing Shalabi’s music, getting inside the spirit of the score, and following his conduction. In combination with the peaking intensity and electricity of Sam’s compositional vision, The Big Mango coheres, sparkles and soars: a distillation of the sonic trajectory Land Of Kush has been charting for the past six years.